Algeria and Leicester City forward Riyad Mahrez has been named the winner 2016 BBC African Player of the Year award. The announcement was made on Monday by the BBC. Mahrez beat off competition from Gabon and Dortmund striker Pierre-Emerick-Aubameyang, Senegal and Liverpool's Sadio Mane, Andre Ayew of Ghana and West Ham United and Yaya Toure of Cote d'Ivoire and Manchester City who won it in 2015. Mahrez had a memorable year for Leicester City, playing a key role in the Foxes winning their first-ever English Premier League title last season. And to cap a wonderful season, Mahrez was voted EPL Player of the Year. 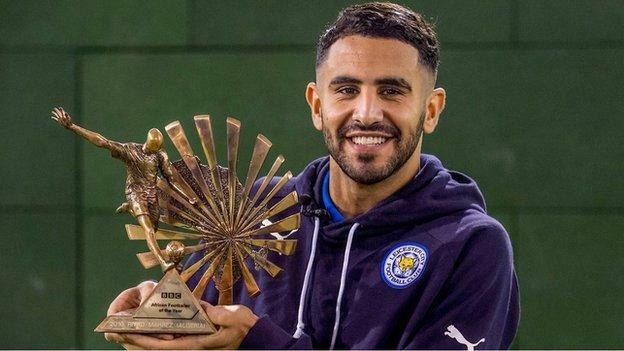 Mahrez becomes the fourth North African player after Mohamed Aboutrika (Egypt), Mohamed Barakat (Egypt), and Yacine Brahimi (Algeria), to win the BBC award.